What is tire or wheel balancing? Wheel Balancing is a method of weight compensation that allow your tires and wheels to spin free of vibrations, thus ensuring a smooth ride. This is essential, because different parts of your wheel assembly weigh differing amounts—and an imbalance as small as 1/2 ounce can be felt in in most modern vehicles. New tires come pre-balanced, but over time a variety of factors can cause both "up-and-down" (static) and "side-to-side" (dynamic) imbalances, such as tire warpage, sidewall stiffness, heavy or light spots in the tires, misalignment, and so on. The wheel balancing experts at Ian's will carefully check for any heavy spots on the wheel-tire combination and compensate for it by placing a measured counterweight on the opposite site of the wheel. You feel vibration in the steering wheel at certain highway speeds. You feel vibration in the seat or floorboard at certain highway speeds. Ian's uses a top-of-the-line, high-speed computer calibrated spin balancer from Hunter Engineering Company called the Road Force GSP9700. 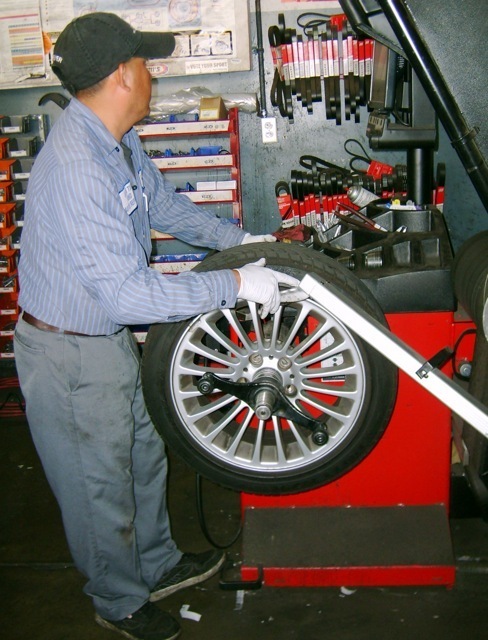 We offer two levels of wheel balancing service. 1. Tires are mounted with care to prevent damage to wheels. 2. Manufacturer's recommendations for adaptors are used to provide optimum balance. 3. Two-plane dynamic balance is performed to eliminate "up-and-down" and "side-to-side" imbalance. 4. Lug nuts are evenly tightened to manufacturer's specification to ensure an optimum ride, prevent rotor warpage and ease removal. 3. Computer simulated road test is performed to determine if wheel and tire are "round when rolling." 4. If indicated, the tire and wheel are repositioned to optimize roundness for the smoothest ride. 5. Two-plane dynamic balance is performed to eliminate "up-and-down" and "side-to-side" imbalance. 6. Lug nuts are evenly tightened to manufacturer's specification to ensure an optimum ride, prevent rotor warpage and ease removal. So, next time you feel a vibration while driving—no matter how small—make an appointment at Ian's. Our professionals will help you determine the cause, whether it is from an imbalance or something else, and fix the problem quickly.